It was okay sometimes it sounded like the characters were making up words.That was all the thing I think that would need help on but anyway it was the best. I thought it was a little bit better then the The lemonade war. In this third book, Jessie and Evan are on their way to their grandmother's house, but things are very different-- their grandmother has forgotten something on the stove and done very serious damage to the house. New Year's Eve, which usually involves a big party and ceremonial ringing of a historic bell on the nearby hill, will be a different affair. Their mother is concerned; they manage to get the house fixed, but there is no quick fix for their grandmother, whose dementia is so severe at times that she doesn't even remember Evan. This makes the disappearance of the bell even more worrisome. Jessie and Evan have their suspicions, but start looking for the bell with the help of a neighbor boy, Maxwell. When their grandmother wanders off, however, Jessie and Evan have more to worry about than the bell.Strengths: This reminded me very strongly of Miracles on Maple Hill-- something about the setting, the tone, I'm not sure what. A good read and subtle mystery.Weaknesses: Maxwell is described in a way that makes me think he might be identified as on the autistic spectrum. He does a lot of rocking, has verbal ticks, and does not seem as mature as a 6th graders should be. Yet, when Jessie asks his mother "what is wrong" with him, the mother replies "He's just different, that's all. He sees things differently than we do." I think the situation with Maxwell could have been explained much more clearly. Wow, this was a lot heavier than the previous two books. The Lemonade War and The Lemonade Crime both dealt with some fairly complex emotions, but they had an overall can-do attitude, whereas this one is more about resignation with the sucky way that life is, as the children visit a grandma with dementia who can no longer reliably recognize them, make an autistic friend, and meet some legit scary neighborhood boys who torture animals. I'm just saying, reading it as a light palate-cleanser to after yet another tearful episode of "Call the Midwife" was a mistake: this volume has such a similar tone of downbeat, minor-chord, bittersweetness that I could hear the "piano theme for baby with spina bifida" in the background as I read it. The general life lessons are "some problems have no solution" and "this is the way things are now. "I'm not necessarily complaining, mind you. Not all books can be light and fluffy, and books which depict difficult situations can play an important role for children who have faced similar situations and need help making sense of it and for helping to develop empathy in others. That said, while I respect this volume, I'm not sure I would want to re-read it. I miss the fun. Also, this book is lacking in the practical life lessons and word problem puzzles we've come to expect from this series. That's an aspect I really liked in the previous books, which I felt set the series apart in a really cool way: the introduction of practical concepts that children are not usually taught: finance in the first book and law in the second. Although the concepts are complex, they are presented so straightforwardly that they are easy to understand. That is a really strength of the series, but I felt this one could have done more with. It has some vague recurring themes regarding maps, diagrams, and spatial analysis, but it needed to develop it a lot more. It didn't have the definitions and worked examples that the previous books had. Instead, the emotional story expanded and took over the book. Jessie would not approve. A decent sequel to the first two books in the Lemonade War series. These books are highly readable, short and compact. Lacked that extra thematic element of the first two: economics and marketing in the Lemonade War and the justice system in the Lemonade Crime. Those interactive recurring elements made fairly typical stories stand out. This book that lacked that special element and was just a fairly typical story about a missing object. Evan and Jessie, in this story, arrive at their grandmother's farm after she accidentally caused a fire and had to stay a week in the hospital. Upon her release, they find Grandma isn't quite the same as they remember her. She has either dementia or alzheimer's, and that topic is treated pretty sensitively. Evan and Jessie also meet Grandma's neighbor - a 12-year-old boy named Maxwell, who has a form of autism or asperger's syndrome. That topic is treated fairly well until the end, when Jessie likens a particularly confusing conversation with him to being in a mental hospital. That's not an appropriate remark and doesn't ring true for an 8-year-old, who wouldn't understand what that means anyway. I think the author was trying to illustrate how a child would view talking to someone with autism, but it just didn't make sense.Not a standout in the series, but fans of the first two will read this and probably enjoy it despite its lack of cohesion. This is a five-part series, so I'm interested to see where the final two will go. It would have been nice to see lemonade incorporated into the Bell Bandit in some capacity, but you can't blame an author for wanting to try something new. However, for a fourth-grader, sometimes that continuity is needed. This is the third book in The Lemonade War series but it's actually a stand-alone. I wasn't as prepared for the depth of the themes in this book - Grandma Treski has Alzheimer's (although there is no label given to her behavior), Maxwell is most likely autistic (although he is just labeled as different) and there is a scene of animal torture that the neighbor boys commit that made me hold my breath to see how it turned out. All in all, a very good read but in a very different tone from the previous books. We had a lot of discussion while reading. My kids and I have loved reading The Lemonade War books out loud to each other, but I didn't like this one nearly as well as the others in the series. Usually each book introduces industry-related concepts with each chapter, but this book doesn't have that. And I found the characters' interactions with their Grandma, who's starting to suffer from dementia, to be disturbing / upsetting at times. I respect what the author was trying to do, but it made it less fun. I strongly recommend the series, but recommend skipping this one. I didn't like this book as much as the first two because it deals with heavier subjects. Still, it is very well written. I believe that Evan grows up a lot in this book, having to learn a new way to communicate with his grandma who doesn't remember him all of the time. Jessie meets a new friend who has an even harder time with feelings than she does. A lot of changes are happening to both Jessie and Evan in this book, and some of the subjects this book brings up may be hard for some children to understand. Still. They are relevant issues in today's world. Another delightful story in The Lemonade War series. In this one, Jessie and Evan try to understand what is happening to their Grandma, who has become confused and forget. They also try to solve the mystery of the town's missing historical bell.I continue to enjoy this series that I am reading at the recommendation of my 10-yr-old niece. The author writes meaningful stories with good messages for middle school aged kids. Plus, they are lots of fun! Evan and Jessie have to go to their grandma's house because she needs some help because her kitchen burnt down. And there is a strange kid named Maxwell that lives just down the street from their grandmother and him and Jessie become pretty close. They decide to walk up to the bell up on the hill that they ring every New Years, but the bell ended up not being there. And they went over to Maxwell's house and the bell was in his closet. He hadn't told Jessie it was there but he said he took it because he heard two boys saying they would takes it and after Jessie was frustrated with him, so they put it back on and they were able to have the same new years after all. The theme for this book it people should not lie, and people should not steal. People should not lie because like in the book, Jessie got frustrated with Maxwell because they were searching everywhere for that bell. And it ended up being in his closet. People should not steal because all of Jessie and Evan's family were concerned about it. So Maxwell caused a lot of trouble lying and stealing. This book was pretty good because I was very concerned about their grandma and the bell. It kept me entertained and was a bit suspenseful. And there were some parts that I didn't see coming at all. The author did a great jot at keeping me distracted from one thing. But then going back to another entertaining or suspenseful part. So far, I still like book one in this series the most. Whereas Book 1 had moments of humor, I thought that the subject manner in this book was a little heavy for a children's book. One of my third graders who is reading the series at the same time as me thought the part about the grandma was pretty sad. The grandma probably has Alzheimer's and goes in and out of remembering things about where she is and who her grandkids are. Additionally, one of the kids in the book probably has autism or is on the spectrum. As an adult knowing about this disorder I can understand the kid's actions. I'm not sure a kid reading this book would understand these actions without adult explanation. I'm looking forward to reading the next book in the series. I wasn't as into this book as the first two. This one changes settings (to Gramma's house) and rather than the main conflict being between kids, now it's a family matter (Gramma) as well as a little mystery about a missing bell. I would have liked to see some consequences for certain side characters in this book, or maybe more interaction from adults - perhaps explanations or something rather than leaving Evan and Jessie guessing and confused. I will continue to read the series as there are only 2 books left, and it is a rather quick read if I can ever sit down and do it, though if the series was significantly longer, I might have considered stopping after this one. I didn’t read the others in this series, so I experienced this as a stand alone book and found that it holds its own beautifully. I loved the caring brother figure, the deep love of the family taking turns sharing the loads of life, and the complexities of mental health and diversity that were brought up in this book. I especially love that concepts like this were brought up in a book for elementary aged students. Also, I always appreciate a non-gory mystery! A good read! This is one of my favorite books it had so much dialogue, thought, and action. There was not one moment where I didn't want to read this book. At the end of every chapter it was a cliff hanger so you just wanted to read more and more of the book. In the book, The Bell Bandit by Jacqueline Davies places Evan and Jessie going to their Grandma’s house. The go there every Christmas and stay until New Years. They are going also because grandma’s house was on fire. When they arrive, they see all the damage the fire made. Then, Pete the repair guy comes and asks Evan for some help the next day. Evan says yes. Jessie goes out to see the bell and discovers it is missing. She rushes back home and tells her mom and Evan that it is gone. Evan and Pete got the hole in the wall fixed and was cleaning up when Jessie told him that the bell was gone. Then, Grandma came home and got all confused and thought that Evan burnt the house. The next day, Grandma and Jessie worked on the puzzle and talked about the bell. Jessie didn’t mention that the bell was missing. Maxwell comes in and has Jessie watch Get Smart. Jessie suggests that they should become spies and find out who stole the bell. The next day when Pete and Evan were fixing the roof, his mom wanted Evan to take Grandma on a walk. He tried to avoid the hill where the bell is, but Grandma goes up there and sees it is missing. She then completely forgets who Evan is and accuses him of stealing the bell. Evan asked if he could help her home and that his mom sent him. Grandma agreed. When they got home, Evan’s mom tries to take her coat off, but Grandma refuses and says it is time to feed the chickens, even though she doesn’t have chickens anymore. The next day, Pete showed Evan how to use a plumb bob. When Grandma wanted to go for a walk, Evan asked if he could come along. She said she’ll be waiting outside. Evan Looked for his shoes, and when he got outside, she was gone. Jessie and Maxwell made a map of all of the houses within the vicinity. There was one house where mean boys lived in. Jessie said thats where they should spy first. They head over to the house and watch. Evan looks for Grandma and sees Pete’s truck and tells him what happened. He figures that he needs Jessie to help him out. He hears a scream and shattered glass. Before the glass breaks, Jessie sees that they created a device and were using a live frog to test it. The boys tied the string onto the frog’s legs and began stretching the frog. Then, Maxwell threw a rock through the window. Evan runs and sees that the boys that were in the barn and Jessie were there. Jessie told Evan what happened. Jessie begins throwing rocks at the boys and rescues the frog. They begin looking for Grandma. Jessie figures out where Grandma is. They go to the teepee that they built last summer and find Grandma. Evan takes her home. Jessie goes to see Maxwell. Will They find the bell before New Years. Or will they just have to celebrate it without ringing it? Find out in the Bell Bandit. The Lemonade War books are precisely the kinds of stories I loved as a kid - they stick close to home, involve real life problems, and always come to a happy conclusion. This third book of the series, entitled The Bell Bandit, sees siblings Evan and Jessie Treski undergoing a period of change. Their grandmother has started to lose her memory, and recently she accidentally set her house on fire by leaving a burner on. When Jessie, Evan, and their mom visit her for New Year’s, Evan is surprised that his grandmother doesn’t seem to remember him, and Jessie is devastated to learn that the bell they ring every New Year’s Eve to welcome the new year has gone missing. Jessie, determined to keep things as familiar as possible, enlists the help of Maxwell, a neighbor boy who has autism, in helping her solve the mystery of the missing bell.This heartwarming story continues with many of the story threads from the first two books. Evan and Jessie continue to grow apart, as Evan spends more time listening to his iPod and Jessie continues to wonder why her brother doesn’t want anything to do with her. As Grandma’s condition becomes apparent, however, the two still find they need each other. Evan, especially, realizes that Jessie’s puzzle-solving skills are the one thing that might be able to help him find his grandmother, after she goes missing on a late-night walk. Though there are some outside influences - Maxwell, a couple of neighborhood bullies, and another neighbor who helps to fix Grandma’s burned house - this story really comes back to the core family bonds that made the first book so satisfying. The author has a real talent for describing kids’ emotions in a whole host of situations, and that makes Jessie and Evan seem much more real than many other middle grade characters.Like the first two books, which lent themselves nicely to curriculum connections with math and social studies, this one could be associated with map skills, as Jessie and Maxwell construct a map of the neighborhood to help them locate the bell. It’s also a gentle introduction to the difficulties of helping a family member with dementia which might help comfort and guide kids who are facing that experience. It’s also great to see a character with autism involved in a story where he isn’t labeled, and where his differences are an asset to the story, not just an opportunity to teach a lesson about disabilities.For another heartwarming family story involving siblings and an ailing grandparent, try Ten Rules for Living With My Sister by Ann M. Martin. Additional read-alikes include Jake and Lily by Jerry Spinelli, The Year of the Dog by Grace Lin, and Carolyn Haywood’s Betsy stories. The Bell BanditBy: Jacqueline DaviesReview By: Joon Sung OhThis book is about the Treski family driving to their grandmother's house for the New Year. But there was a big problem-their grandma had left the stove on and burned the house, so Evan and his sister, Jessie, and his mom, Susan, decided to leave early and stay till New Year's Day to see if their grandma was okay after the accident. When they got there, the main conflict rose-their grandma's old bell that is rung every New Year's Eve at midnight, was gone! So in hope of finding it, Evan, Jessie, and a neighbor, Maxwell, planned a search to find the missing bell, and later succeed in finding it and was replaced on top of Lovell's Hill where it belonged in time for the town to be able to ring it in the New Year.I liked how the author gave diagrams from Jessie's notebook of the setting whenever a new one was introduced. They gave me a perspective into what Jessie was drawing. Also, I liked how the author builds suspense throughout the story by making things and events unknown to the reader. For example, ""Hey," said the man. "Is your mom around?" Evan stood there looking at the man, trying to figure him out. Was he dangerous? Who was he?" Another example is, "There was the crest. There was the crossbeam. But the bell was gone." Finally, I like how the author included many examples of figurative language, such as similes, metaphors, personification, and onomatopoeia, which added detail and kept me interested in the story. The author wrote, ""Oh my," said Mrs. Treski, turning off the ignition and letting the car lights die." The author explains what exactly was so shocking, which was the burnt house, in the next chapter following this concluding sentence but leaves this chapter on a cliffhanger. The author used personification by saying that Evan's mom let the car lights "die." The author is giving human like qualities to a no living thing-the car's lights. They do not actually "die," they just turn off after a while. Also, the author includes numerous similes, An example is, "He'd been following Pete and his mother thought the whole house, fascinated by the things that Pete described-the inner workings of the house like it was an animal that lived and breathed. This quote is comparing the house to a live animal.In conclusion, this is a book that is worth reading. This book is appropriate for kids in middle school that like books that are very suspenseful with twists and turns. Overall, I was always engaged in this book and would recommend it to everyone! i liked it. i liked how it had such a twist ending. i thought that it was funny that the grandma had amnisha. I just finished reading The Bell Bandit, by Jacqueline Davies. This author has been writing children's books for over a decade. The genre is realistic fictional/ mystery. This book is a part of the Lemonade War series. The following a summary from this book and my opinion on The Bell Bandit. My favorite character is Jessie because she is a problem solver and never gives up. Do you never give up like Jessie too? One quote from the book is "Yeah, well, tell Grandma that. You can talk to her. She remembers you." The plot of the story is that the bell goes missing and Jessie and her brother try to find it. The theme of the story is that if you persevere and never give up than you will accomplish your goal.The main character of this book is mostly Jessie. She likes to solve mysteries and puzzles. Jessie and her family went to visit her Grandma in the mountains after Christmas. They went to Lovell's Hill to see the bell they ring on New Year's Eve. It was gone. Grandma was getting forgetful and also saw that the bell was missing. Jessie, Evan (her brother), and Maxwell (a neighbor boy) try to look for the bell. Will they find the bell in time to ring it on New Year's Eve?I thought this book was good because it made me want to read more and was very enjoyable. If you like reading mysteries you will like reading this book because it kept you on the edge of your seat. If you are age 9-13, I recommend this book to read. Compared to the other books in the Lemonade Series, I liked this book the best because it was easy to follow the journey of each character throughout the book. Do you think this is a good book for you to read? I liked the way the book was written because I could visually imagine what they were doing and being outside in the cold of winter trying to find something you think you will never find. I give this book 5 stars because I felt like I was trying to solve the mystery along with them. I've loved every one of the books in the Lemonade War series because of the siblings Jessie and Evan but also because this author does not condescend to her readers or paint the characters and the situations they face in a simple fashion. Children are more complex than many adults imagine, and the way they feel about life is just as complex. This author never fails to remember that, even as we weaves her stories. In this title, the Treskis have driven to the home of the grandmother of Jessie, 9, and Evan, 10, during the Christmas holidays because of an accident their grandmother had. From the beginning of the story, it's clear that something is wrong. Grandma had accidentally set the house on fire, and once she returns home from the hospital, she is increasingly disoriented. Her periods of knowing her beloved grandchildren and her whereabouts contrast vividly with her periods of confusion during which she slips into the past. Jessie ends up befriending a neighbor boy named Maxwell while the two of them try to figure out where the huge bell that usually sits atop Lovell's Hill has gone. Jessie suspects the Sinclair boys of taking the bell, which has an important part in a New Year's Eve ritual followed by the neighbors of this small area near Lake Placid. But as they spy on the Sinclairs, they find them torturing a frog just as they have bullied Maxwell in the past. Evan comes to Jessie's defense against the boys while he is trying to find his grandmother who has wandered away from home. Strong writing, interesting characters, and two children whose lives are suddenly changed by events beyond their control make this one a keeper. While there is quite a bit going on in the story and readers who have read the previous two titles will understand the relationships better, this is still a satisfying read with several surprises. 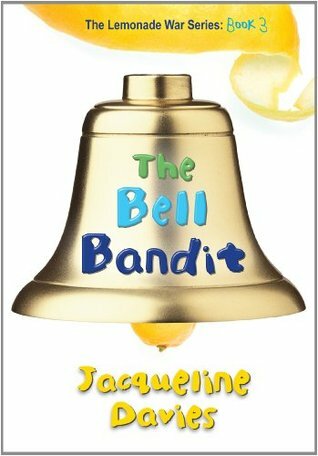 The Bell Bandit by Jacqueline Davies	The Bell Bandit, by Jacqueline Davies, is the third book in the series which began with The Lemonade War. We are already familiar with the main characters, Evan and Jessie, from the first two books. To really enjoy this book you should have read these books first. The Bell Bandit is a mystery about a bell that has been stolen from the top of a hill. The bell was used to ring in the New Year. It was always rung by the oldest and youngest members of the community. The book is about the search for the thief which is made difficult because Evan and Jessie’s grandmother who is the only witness to the theft. But she is having memory loss. The plot of The Bell Bandit is very exciting. Grandma house’s has caught fire, and there is a hole in the wall large enough for a car to drive right through. The house is to soon be fixed, but this is a lot for Jessie and Evan to endure. They are trying to solve the mystery of the theft, but Grandmother can’t remember some things at some times, and the bell is gone. Who could have stolen the New Year’s Eve bell and what would they want with it? This book is exciting because the author creates a lot of suspense and an interesting plot. The book is written from a narrator’s point of view, but there is a lot of dialogue and you feel that you learn the story from Jessie and Evan’s point of view. This is a fiction book written for children, but it is so exciting, that adults can enjoy it too. I thought this was a four star book. I thought this because this was the type of book that left you hanging at the end of each chapter, wondering what happened. One of my favorite genres to read is mystery, so if you love mystery books like me then I think you should read this book. This book isn't a very challenging mystery; it is kind of an easy read. So if you like a reading challenging mystery book then you probably won't like it. Even though this book wasn't very detailed, I liked all the adventure that happens.This book is about a girl named Jessie, a boy named Evan, and their mom. They take a visit to their grandmother. They are going to see her in the hospital, because she fell and hurt her wrist while her house was on fire. Now, her house has a huge gap in the wall. Then, this guy named Maxwell(who is only two years older than Jessie) comes and becomes Jessie's friend. Then, out of no where the grandma forgets who Jessie and Evan are! To top it all off, the New Years Eve bell is missing! The New Years Eve bell is a bell that their grandma rings every New Years Eve. Maxwell wants to help Jessie find out who took the bell. Jessie can't take it all; the grandmother sometimes losing her memory, the bell is still missing, and they have a huge gap in the grandmother's house. Everything is going badly, but that wouldn't stop Jessie. I liked this entire series of Lemonade War books. This was Jessica's favorite of the three. (Any books with a character named Jessie are usually good.) She really enjoyed that you have to use other skills like math to figure out what is going on. I missed the vocabulary word at the beginning of each chapter...and the integrated lessons. Book one had marketing and economics, book two introduced the justice system, this book had no other academic lessons. The kids didn't notice. I wish that Davies would have somehow also used lemonade in the title somewhere. I think more kids would be apt to pick up this third book, and it would unite the series.There is a lot going on in this story despite the lack of integrated lessons. The grandmother has alzheimer's and the neighbor boy, Maxwell has asperger's syndrome. There are simultaneous mysteries and twists and turns which make it a quick easy read.One thing that really was bothersome was towards the end when Jessie makes a reference to a mental hospital when describing a conversation with Maxwell. I'm not sure that this is appropriate...but again, the kids weren't bothered by it. But I think it may be misinterpreted easily. The Bell Bandit is a mystery book. I love this book because the book is very suspenseful. After every chapter I want to read more and more because I want to know what will happen next. In the story Evan and Jessie are going up to their grandma's house a couple days after Christmas. They usually spend their Christmas with grandma but this year they didn't because grandma's house had gone on fire since she left the stove on while taking a long walk. When she go back home she saw her house on fire and ran to it but slipped and fell on her hip. Jessie and Evan saw the bell that was rang very new year was not their. They met Maxwell, grandmas nieghbor and worked together to find the bell. At the end Maxwell had the bell and his excuse was that they never asked him if he had it. During this time grandma had forgotten Evan and had to be reminded about a lot of things. This book had a lot of different turns in it, some good and some bad. I loved this book especially because the ending was very surprising. I actually think I liked this book of Jacqueline Davies best of all. The third in the Lemonade War Series, Evan and Jessie are visiting their grandma's house after Christmas. But things are not the same as usual. There has been a fire in Grandma's house and when released from the hospital Grandma has spells in which she doesn't seem to recognize Evan. In the meantime Jessie is working with a neighbor boy to try to discover who stole the bell that has stood on her grandmother's property, which they ring every new years. The boy, Maxwell, throws suspicion towards some new neighbor boys, and Jess and maxwell work together as spies to see if they are the culprits.I found this book to be much more sensitive than the other books as Evan and Jessie are forced to understand that their grandmother is different and things will never be the same again. Jessie also is forced to understand Maxwell, who seems to have Autism or Aspergers Syndrome, and sees some of his difficulties as her own. Not able to put my finger on the exact reason why I didn't like this book as much as the rest in the series. Sometimes I felt Evan and Jessie were too immature for their age (ie tantrum-like behavior). Sometimes I felt the plot was dragging and would just be starting to build when the point of view changed. OR perhaps it was the lack of new vocabulary at the start of each chapter or the lack of a content area concept tie-in (economics/law) that would make this more feasible as a read-aloud. As normal, Jessie and Evan have to deal w/ a lot in the very few days that span this book. Though the illnesses were never named, I appreciate the way the author helped the children learn about and deal w/ Alzheimer's and Autism. The resolution for all the topics is great for the younger readers. Though the characters are the same, this was more stand-alone than book 2 in the series. As a KC3 nominee next yr, I hope my students end up enjoying it more than me. This is the 3rd book in the Lemonade War series. Several days before New Year’s Eve Jessie, Evan, and their mother travel to Lovell’s Hill to visit Grandma. Every New Year’s Eve the Treski family and their neighbors gather on the hill to ring the historic bell that has been in the family for hundreds of years. This year is everything is different. Grandma’s memory is slipping. She becomes easily confused and agitated and sometimes she doesn’t remember her own grandchildren. To make matters worse there are some strange new neighbors and, worst of all, someone has stolen the bell. Can Jessie solve the mystery of the missing bell? Can she and Evan cope with the changes in Grandma? Jacqueline Davies deals with a number of difficult issues in this novel, such as, bullying, dementia, and autism. One cautionary note -- There is a chapter in which Jessie and a friend witness the neighborhood bullies preparing to torture a frog. I found that part to be quite disturbing. A solid book. Feels a bit different than the first 2 in the series where there is a math, then a judicial educational aspect to the story lines. For this book it's more about people and special needs they may have. The Grandmother is suffering from Alzheimer's (or Dementia- they never come out and say exactly what it is), and another character shows signs of Autism (again not specifically stated and he is an interesting companion to one of the main characters who has some slightly similar traits). A great book for discussing differences and changes in people and sometimes their roles. There is even a bit of a discussion about 'mean' boys though I felt they could have done more with that- but I think the goal was to open it up for deeper discussion or thought outside of the book. Be warned, the mean boys do get involved in the torture of an animal, and later (not with the boys) there was a brief mention of decapitation. Evan and Jessie take a trip to see their grandmother in the mountains. This time they must solve a mystery: what happened to the bell that sits atop Lovell's Hill? The bell is a central part of their New Year's Eve tradition and it's gone missing right before the big holiday.Aside from the mystery, Jessie and Evan deal with some difficult situations. Grandma has more than a few forgetting spells and doesn't recognize Evan. He must find the strength to successfully navigate situations even adults would struggle with when Grandma goes missing during a snowstorm. Meanwhile, Jessie makes friends with Grandma's neighbor named Maxwell. He is very smart, but interprets the world a little differently than everyone else. This friendship challenges Jessie, but in ways that help her grow. No label is provided in text, but Maxwell seems to be on the autism spectrum. Overall, another good read by an author who writes kids so well you'd think she's never grown up.